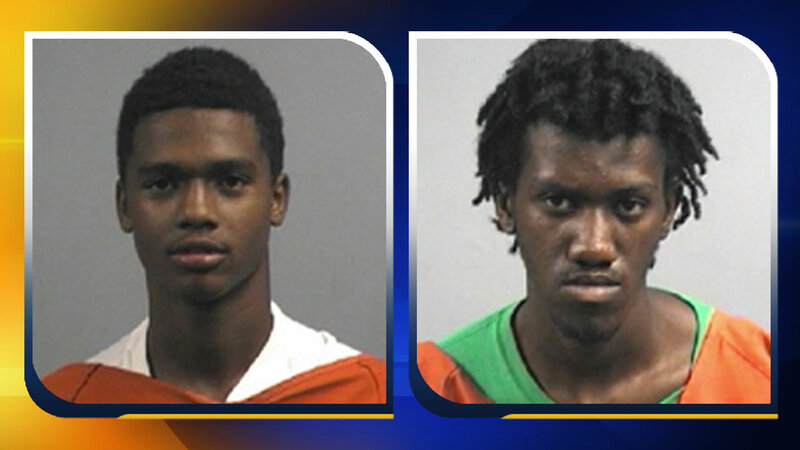 GOLDSBORO, NC (WTVD) -- The Goldsboro Police Department has charged two teens in an October 13 murder. Just after midnight that morning, officers got a call about shots fired and found a car that had crashed into a parked vehicle in the 200 block of West Spruce Street. Inside, they found 32-year-old Abdullah Ali Whitaker unresponsive. He was pronounced dead at the scene. Friday, detectives got first-degree murder warrants for 17-year-old Corey Devon Sutton Jr. and 18-year-old Terrance Lavon Forbes. Sutton was arrested with the assistance of the Wayne County Sheriff's Office Swat Team Saturday morning on Charles Street. He's being held without bond. Forbes is still on the loose. Anyone with information on his whereabouts is asked to call Crime Stoppers at (919) 735-2255 or text at (919) 222-4230.